A veteran leader in the environmental movement, Carl Pope is the former Executive Director and Chairman of the Sierra Club. He’s now the principal adviser at Inside Straight Strategies, looking for the underlying economics that link sustainability and economic development. He serves as a Senior Climate Adviser to former NYC Mayor Michael Bloomberg, and together they wrote Climate of Hope, published by St. Martin’s Press in April 2017. 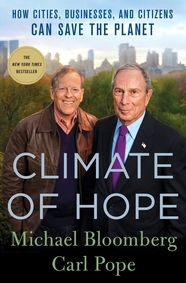 Learn more about Carl’s latest book, Climate of Hope, co-authored with former NYC mayor Michael Bloomberg. Listen to Carl Pope and Michael Bloomberg discuss Climate of Hope on NPR’s Morning Edition. Read Carl’s latest contributions to The Huffington Post. Listen to Carl talk to Forbes about how businesses will overcome climate change. Check out Carl’s LinkedIn page and follow him on Twitter. Learn more about what the Sierra Club is doing to protect our planet. "Climate of Hope is an inspiring must read." "If Trump is looking for a blueprint, he could not do better than to read a smart new book, Climate of Hope."